I am reviewing this book from my own viewpoint. I am a revolutionary anarchist who has concluded that Marx’s critique of political economy is the most useful economic theory for understanding how capitalism works. This was the opinion of Bakunin and of many anarchists since (see chap. 3 of Black Flame, Schmidt & van der Walt, 2009). I do not call myself a Marxist, however, because there is also much in Marx’s theories with which I strongly disagree, not to mention my rejection of the theory and practice of most of the post-Marx Marxists. It is from this viewpoint that I critique David Graeber’s contribution. Much of this book is very interesting as well as clearly written, lively and witty. It covers an amazingly wide range of topics, over its “5,000 years.” This includes lengthy discussions on the possible origins of money, the role of debt in various religions, the relation of slavery to the beliefs of the “heroic” age, the origins of “please” and “thank you,” temple prostitution, the interaction between early markets and early states, and many other topics—which makes it difficult to review! Graeber avoids Eurocentrism, by looking at economic developments on a world scale, covering the major regions of human settlement as they evolved separately and together. Even when I disagree with him or (more often) am not sure whether he is right, I find his writing thought-provoking. Unfortunately, due to space limitations, I cannot write about most of the subjects he raises. His book is best treated as a history of debt, credit, and money, and of the interaction of these with other aspects of society (politics, family structures, ideologies: religion, philosophy, and morality, etc.). From my viewpoint, stated above, I have no problem saying that debt and credit are vitally important in economic history as well as today. “Credit plays a central role in the most basic processes of capital accumulation and it lies at the core of Marx’s account of the system” (Choonara, 2009; p. 100). This problem appears in his discussion of slavery. Graeber emphasizes the centrality of slavery to social development. At certain times and places, slaves were even used as money. Slavery was central to the self-conception of the “heroes” of certain societies. Slavery laid the basis for modern economies. Graeber describes this important institution: “…What is slavery?...Slavery is the ultimate form of being ripped from one’s context, and thus from all the social relationships that make one a human being….The slave is, in a very real sense, dead” (2011; p. 168). This is true and even insightful. Yet it leaves out what almost anyone—even those who never heard of anarchism or Marxism—would include: that slaves were forced to work, with barely any return, for someone else. The whole point of ripping people from their social contexts and making them legally dead was so that a minority (a boss class) could work them like ill-fed animals, give them as little sustenance as possible, and then take the results of their unpaid labor. In other words, the point of slavery was exploitation of human labor. And the history of ancient slave empires, as well as of more modern chattel slavery in North and South America, was a history of class conflicts between the slaves and the master classes. Marx could have been responding to Graeber (agreeing and disagreeing) when he wrote, in Capital, vol. 1, “The class struggles of the ancient world took the form chiefly of a contest between debtors and creditors, which in Rome ended in the ruin of the plebeian debtors. They were displaced by slaves. In the middle ages the contest ended with the ruin of the feudal debtors…. Nevertheless, the money relation of debtor and creditor that existed at these two periods reflected only the deeper-lying antagonism between the general economical conditions of existence of the classes in question” (1906; p. 152). The “deeper-lying antagonism between classes” was that one class exploited the labor of others. Slavery, serfdom, debtorship: these were all mechanisms for exploitation. It is indeed valuable to analyze how these mechanisms worked, including the creditor-debtor relationship. But we should never forget that the purpose of any of these methods was the exploitation of labor. Similarly, Graeber misstates the meaning of wage-labor under capitalism. He refers to “…that most basic, dominant institution of our present economic life: wage labor” (2011; p. 206). But he writes this in the context of discussing the legal philosophy of rights and liberties. He writes that “a wage-labor contract is…[an] agreement between equals to no longer be equal (at least for a time)…. It is the very essence of what we call ‘debt’“ (p. 120). Graeber notes that “socialists…saw capitalism as the system whereby those who own capital command the labor of those who do not” (p. 345). This is not his view, however. Graeber notes that banks and bond markets and other financial institutions had come into existence “before the rise of factories and wage labor itself” (p. 345) and therefore “capitalism” can be said to begin before there was wage labor. There is no point in quibbling over definitions. Certainly the early market economy developed all sorts of economic apparatuses which paved the way for the eventual development of a fully capitalist society. But a qualitative change occurred with the spread of wage-labor, which Graeber has correctly called, “the most basic dominant, institution” of capitalism. Graeber misunderstands what capitalism is. He describes it as “commercial society,” an economy driven to expand its money, to growth and accumulate its wealth. A marginal few in pre-capitalist economies sold commodities to get money in order to buy new (and more desired) commodities. But capitalists, he says, take money to buy commodities in order to sell these commodities for more money than they started with. Graeber applies this to early merchants (who bought goods in one place in order to carry them to distant places and sell them for a higher price due to their rarity). But such merchants (like the Polo brothers) did not increase the overall wealth of society, they only moved it around. Under capitalism (as Marx saw it), the industrial capitalists buy raw materials and machinery, in order to combine them with the labor-power hired from workers. The labor of the workers makes new things and new values, including unpaid-for surplus value. That is how capitalism expands. Graeber works his way through several theories of the origins and the nature of money. He concludes, “…there is an unresolved debate between those who see it as a commodity and those who see it as an IOU. Which one is it? ...It’s both…. Money is almost always something hovering between a commodity and a debt-token” (pp. 73, 75). Yet his whole book focuses on the nature of debt (credit) and says virtually nothing about commodities, what they are and how they evolved. Is this because commodities cannot be discussed except by acknowledging that they are objects and services provided by human labor? Compare this with the very first paragraph of Marx’s Capital: “The wealth of those societies in which the capitalist mode of production prevails, presents itself as an immense accumulation of commodities, its unit being a single commodity. Our investigation must therefore begin with the analysis of a commodity” (1906; p. 41). This is a different concept of what capitalist society is and how it needs to be analyzed. Together with his silence about what commodities are, there is Graeber’s silence about economic “value.” Considering money, Graeber demonstrates that both the commodity theorists and the credit theorists agree that the function of money is “to measure the value of other commodities” (p. 44). “A gold coin is a promise to pay something else of equivalent value to a gold coin” (p. 47). “What we call ‘money’…is a way of comparing things mathematically, as proportions: of saying one of X is equivalent to six of Y” (p. 52). But to say that things are “equivalent” in certain proportions is to say that they have equal (equivalent) values. What is this “value” that can be measured in terms of how much each commodity has? Marx believed that economic value, the exchange value of the capitalist market, was different from the utility (use-value) of the commodity. The producing (and selling) capitalists do not care what the use-value is of a commodity, so long as there is a buyer who is willing to pay money for it. The exchange value of a commodity is the amount of socially necessary labor time which went into each commodity (as modified by various factors such as the average rate of profit, the effect of monopoly, short-term fluctuations in supply and demand, etc.). Some sort of “labor theory of value” was almost universal among pre-Marxist classical economists, including Adam Smith, David Ricardo, and Proudhon. For example, Ben Franklin wrote, “Trade in general being nothing else but the exchange of labor for labor, the value of all things is…most justly measured by labor” (quoted in Marx, 1906; p. 59). Graeber rejects the labor theory of value but does not say why. Nor does he suggest any alternate approach to value (such as the “marginal utility” approach). In all this big book he has nothing to say about value in the market. (I see that he has written a book which has “value” in its title. Whether it discusses this topic, I do not know.) Yet again, he downplays the importance of labor. Graeber’s writing is weakest when discussing the causes of the current economic crisis. It is sloppy and unbelievable. He states, “Presented with the prospect of its own eternity, capitalism—or anyway, financial capitalism—simply explodes. Because if there’s no end to it, there’s absolutely no reason not to generate credit—that is, future money—indefinitely…. The period leading up to 2008 was one in which many began to believe that capitalism was going to be around forever…. The immediate effect was a series of increasingly reckless bubbles…” (p. 360). Apparently he is serious (he repeats this “analysis”). Was the period before the recent period (say, the post-World War II apparent prosperity) one where people did not believe that capitalism would be around forever? (I lived through the 60s, and I can assure Graeber that most people, alas, thought capitalism was eternal.) Did investors turn to “financialization” in the 80s because they had a new faith in capitalism? Is there any evidence for these claims? If this was so, then why did the bubbles ever pop? A sudden belief in the limitations of capitalism? This view is based on nothing but speculation about mass psychology. It ignores the long term trends (at least since about 1970) toward economic stagnation, overproduction, unemployment and underemployment, underdevelopment and lop-sided development in the oppressed nations, etc. There was a long-term tendency of the rate of profit to fall, together with a growth of monopolization. These caused stagnation in the “real economy” (the production of real goods and services), due to the decline of real surplus value production. In response, capitalists increasingly invested in the “paper economy,” in what Marx called “fictitious capital,” to produce paper profits (which turned out to be unsustainable). Obviously this question would take much longer to explain and debate (see Foster & Magdoff, 2009; Kliman, 2012; Mattick, 2011). At least this explanation is rooted in real factors of labor and production. A major advantage which anarchism has over Marxism, is that Marx was quite vague about any program for a society after capitalism, focusing mostly on current analysis and strategies for change. By contrast, anarchists have offered visions for a new and better society, in more or less detail. But not Graeber. “What I have been trying to do in this book is not so much to propose a vision of what, precisely, the next age will be like, but to throw open perspectives…” (p. 383). Tellingly, at no point in this book, does Graeber identify himself as an “anarchist” or advocate “anarchism,” nor does he call himself a “revolutionary” or advocate “revolution.” At the most, in a footnote, he vaguely remarks that, rather than Marxism, “I am drawing here more on the alternate strain of revolutionary theory, evident most famously perhaps in Peter Kropotkin’s Mutual Aid” (p. 404). However, if we look carefully at his book, we can find the basic principles which he expects to apply to “the next age”. After all, what thinkers believe is central to capitalism’s functioning will determine what they think is necessary to change in order to abolish capitalism and the state. Marx, as well as anarchists of the broad, class-struggle, tradition, believed that exploitation of workers was central to capitalism. Therefore they advocated a cooperative, classless, society, without exploitation, as central to the struggle against all forms of oppression. But if people agree with Graeber that debt is basic to the functioning of capitalism, then they will focus on the abolition of debt (or at least its limitation). Graeber declares that all societies, past present and future, base their economies on three “modalities.” “There are three main moral principles…all of which occur in any human society, and which I will call communism, hierarchy, and exchange” (p. 94). By “communism,” Graeber means that all societies rely on community, solidarity, mutual aid, neighborliness, informal cooperation, and “love.” He specifically denies that “communism,” as he uses it, has “anything to do with ownership of the means of production…. The question of individual or private property…is often little more than formal legality anyway” (p. 95). “’Communist society’—in the sense of a society organized exclusively on that single principle—could never exist” (p. 95). However, Kropotkin and other “anarchist-communists” of “the alternate strain of revolutionary theory” did advocate a cooperative economy with the means of production held collectively (“in common”). From this point of view, Graeber would seem to be rejecting libertarian communism. What Graeber means by writing that there would always be “hierarchy” is not quite clear. Is he denying that an egalitarian society is possible? Is he saying that some sort of state is inevitable? Or is he just saying that even in a classless, egalitarian, society, adults will have responsibility for children, some people may be more influential than others among friends, and so on? Anarchists could accept the latter, but I am not sure if that is what he means. By “exchange,” Graeber means a situation “in which each side gives as good as it gets” (p. 103). This may include exchanging gifts or barter or competitive commercial business. “There’s always some sort of system of exchange” (p 385) which may be a market. Markets can be good and noncapitalist, he claims. Graeber goes to great lengths to repeatedly insist that “markets” and “capitalism” are not necessarily the same. “…The market [and] capitalism (I must continually remind the reader that these are not the same thing)” (p. 376). “Markets, when allowed to drift entirely free from their violent origins, invariably begin to grow into something different, into networks of honor, trust, and mutual connectedness” (p. 386). I agree that early markets (exhanges of commodities at the margins of society) were the not the same thing as developed capitalism (when human labor-power became a commodity and the whole of society was subordinated to commodity production). But capitalism developed out of early commodity exchange (with a big assist by the state). A return to pre-capitalist markets would only make likely the re-development of capitalism. To continue to have markets, implies continuing to have money. Graeber states, “Money was no more ever ‘invented’ than music or mathematics or jewelry….It’s probably as old as human thought” (p. 52). If money is an aspect of human thought, comparable to music or mathematics, then, like music and mathematics, presumably we can expect to always have money. Of all the things he could raise, Graeber makes only one specific “concrete proposal….” It is “…for some kind of Biblical-style Jubilee…” (p. 390). All debts, domestic and international, would be forgiven (he does not say whether this should be periodic, as in the Bible—every 7 years or every 50 years). This would, no doubt, be difficult to win. “…Great imperial states have invariably resisted this kind of politics” (p. 390). Indeed! I would think that to achieve such a demand would require the overthrow of the capitalist class and their state. But anyway, Graeber concludes, “Nothing would be more important than to wipe the slate clean…and start again” (p. 391). This last phrase is revealing. Apparently debts would not be abolished forever; people would start over again, accumulating debts. Without going into detail, Graeber imagines a future society, without capitalism but without common ownership of the means of production either, with some degree of hierarchy, with some sort of market, with money, and with debts. This is not really a revolutionary alternative to capitalism. It is the image of a cleaned up capitalism, without its bad qualities (a good, communal, market, limited hierarchy, debts which are periodically wiped out, etc.). 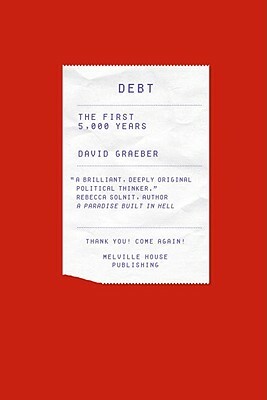 David Graeber’s Debt, The First 5,000 Years, is an interesting and thought-provoking book. It is worth reading as a history of debt, credit, and money. However, it has a mistaken basic concept, that debt is at the center of human economics and society, generally downplaying the significance of human labor (which was correctly emphasized in Marx’s economic theory). For this reason, Graeber has a mistaken analysis of the Great Recession and the current economy. He presents a limited and nonrevolutionary vision of a post-capitalist future, quite in contrast to the revolutionary anarchist-communist (libertarian socialist) program of Kropotkin and others. Note: In the Fall, AK Press will publish a book by me on some of these topics. It’s subtitle will be An Anarchist’s Introduction to Marx’s Economic Theory. It is an expanded and revised version of material which has appeared on www.Anarkismo.net. Choonara, John (2009). Unravelling Capitalism: A Guide to Marxist Political Economy. London: Bookmark Publications. Foster, John Bellamy, & Magdoff, Fred (2009). The Great Financial Crisis; Causes and Consequences. NY: Monthly Review Press. Graeber, David (2011). Debt: The First 5,000 Years. Brooklyn, NY: Melville House. Kliman, Andrew (2012). The Failure of Capitalist Production: Underlying Causes of the Great Recession. London: Pluto Press. Mattick, Paul (2011). Business as Usual: The Economic Crisis and the Failure of Capitalism. London: Reaktion Books. McKay, Iain (2008). An Anarchist FAQ; Vol. One. Edinburgh, Scotland/Oakland CA: AK Press. Marx, Karl (1906). Capital: A Critique of Political Economy. Vol. 1. NY: Modern Library. 1) I do not make debt the main factor of social development. I merely make it the main topic of my book. 2) that slavery and wage labor are forms of exploitation of labor is self-evident. It is absurd to say I don't recognize it. This is like insisting that every time one mentions fascists one has to also clarify that they are right-wing. 3) your claim that I don't see capitalism as essentially a mode of exploitation of labor by holders of capital is false. If you read the book at all carefully it's clear that's exactly what I think. I merely pointed out that the assumption that this exploitation must necessarily occur through free wage labor is historically false. I offered this because I dreamed that Marxists analysts such as yourself might actually THINK about the implications, rather than spout doctrine about how for half of its 500 year history capitalists were somehow "preparing the way" for a system that they didn't anticipate or couldn't imagine at all. 4) I do not say capitalism is equivalent to commercial society. I repeatedly say, as even you acknowledge, that it is not. 5) I do not reject the labor theory of value. I simply note that neoclassical economists, with whom I clearly disagree on almost everything, reject it. In fact I've written an entire book on the labor theory of value. I simply don't emphasize that body of my own theory here. 8) I do not propose a vision for the future. I say quite specifically that I am not going to propose a vision for the future. In fact I say I am making no policy proscriptions at all other than the idea of a clean-slate. Your writing here is disgraceful and you owe me an apology. You've just made things up off the top of your head, based on your (almost entirely incorrect) assumptions about my politics and what you think I would envision Pure hostile extrapolations. When I say "there will always be hierarchies" I make it clear I mean that we'll continue to stop small children from running in the street, or that there are likely to be forms of entertainment involving games and contests and some people will win. When I say "there will always be money" I say in the absolutely minimal sense that there will be some contexts in which we say "12 of those is equivalent to 1 of these." I spell all this out pretty explicitly. 9) I do not say anything, at any point, that might imply that private property in the means of production might endure in a free society. The fact that I note that in the Middle Ages, markets might have had popular appeal does not mean that I think in a revolutionary future there would be private property in the means of production, and extrapolating from one to another is nothing short of insane. Again, you should be ashamed of yourself. If you read the book, you must be aware that I have a long section where I spell out quite explicitly that the very idea of "private property" is founded on violence and slavery and that to imagine real freedom we'd have to get rid of the entire conception. This is one of the few places I do spell out what kind of future I would like to see. You pretend it isn't there and then make up strange twisted reasons to assume I'd endorse the opposite. Again, you owe me, and more than that, the world, an apology for making such hostile misrepresentations of the book's argument. Maybe rather than condemn the book, you should reflect on how you managed to read a book by a theorist who has written extensively in favor of a labor theory of value, uses an explicitly post-Workerist Marxist approach to the current economic crisis, and looks forward to the abolition of the state and capitalism, but just wasn't explicitly emphasizing those aspects in the text, and ask yourself how you so completely missed it all. Because this is really an embarrassment. Yeah I like the smiley pic, too. I hated it at the time but it's kind of grown on me. I responded to the claim I'm somehow unaware of the concept of "primitive accumulation" but I don't know if they put it up yet - or if they will. I agree with the Midnight Notes argument that enclosure and other such forms of primitive accumulation are not a one-time thing but an ongoing process throughout the history of capitalism. This is precisely what I was trying to challenge in the book: the dominant idea that the first 250 years of capitalism (a full half its history) were capitalist because people were somehow preparing the way for wage labor that didn't yet much exist, just without realizing it. If that were true, for all we know, how do we know we're not in capitalism anymore now - because the last hundred years or so have really been a process of us preparing for something that doesn't really exist now but will become important in 2110? Surely we can do better than that. Just to say (not having read David's other book referred to in his point 5 above) that there must be something in his book on debt that makes people think he has rejected 'the labour theory of value' or at least as it is understood by Marx and most marxists as 'Wildcat' in their very useful review 'No Interest But the Interest of Breathing' linked here seem to draw the same conclusion. The Wildcat text on this site 'Is Capitalism a Market Society?' also takes up some relevant themes and that's my next stop for a careful read. Well, the thing is I adopt a rather heterodox version of the labor theory of value that for instance sees women's domestic and care-giving labor as if anything the primary form of value-giving labor, and therefore sees money as only one of many value-forms... It's a long story. The short version is: it would have taken a long time to explain, and I didn't see any compelling reason to distract the reader with an argument internal to Marxist theory in this particular volume. "The question is why the myth has been perpetuated, anyway. Economists have long since jettisoned other elements of The Wealth of Nations - for instance, Smith's labor theory of value and disapproval of joint-stock corporations." Now, you can see this passage doesn't say Smith's labor theory of value (let alone Marx's labor theory of value) is a myth, or that economists should have rejected it. It just says that economists did in fact eject it, so there has to be some other reason they couldn't bring themselves to eject other elements in Smith's work. Nor does it really imply I disagree with Smith (after all, I clearly disapprove of joint stock companies too.) There's also the point that my saying most mainstream economists have rejected something isn't saying much in a book which is all about showing most economists are wrong about everything. But it _could_ be read to imply that I think the labor theory of value is a myth or that mainstream economists were right to jettison it. So I guess, inevitably, some people who were trying to come up with an explanation for why I made no explicit mention of labor theories of value (or any other value theory) in the book ended up reading it that way. To be honest, it never seriously occurred to me, when I wrote the passage, that anyone would conclude I was against the LTV since, as I say, I'd written a whole book on the subject. Perhaps this was vanity on my part. After all, how many people have really read that book? After all, how many people have really read that book? thanks alb - I posted a response. It was nice to be able to have a polite conversation with Marxists for a change. They did the usual "he can't have read Marx because he seems to disagree with my orthodoxy" schtick, but not in a dishonest or particularly offensive way, and when I clarified what my position actually was, unlike Wayne Price, who just kept on weirdly insisting that he knew my position better than I do (I am beginning to wonder now if that guy is completely sane) they actually engaged with it. Very refreshing.